The system introduction using an inverter conversion is advanced due to energy conservation, high-performance and the high functionalizing of machine product in each direction. 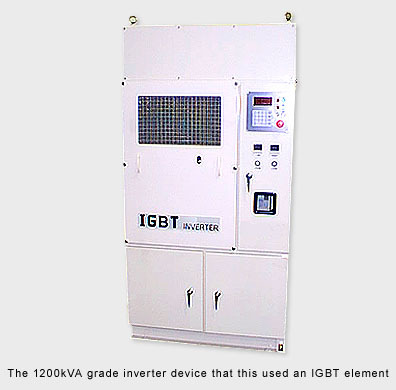 This IGBT form inverter is made to work by connecting the input transformer and the output transformer as a device. It is the inverter system of small light weight which use IGBT (Insulated Gate Bipolar Transistor) of high voltage and high current. The boiling cooling system is adopted as a IGBT device of a center circuit and are doing the high-density implementation.